Dr. William Bengston, professor of sociology at St. Joseph’s College in New York, has spent the last thirty-plus years researching and studying hands-on healing and how it can cure disease. His experiments have led him to conclude that cancer can be cured. While, typically, scientists test their theories in the lab and then begin trials on humans, Bengston went into the lab to test what he was already observing with people who were receiving hands-on healing. His book, The Energy Cure: Unraveling the Mystery of Hands-on Healing, tells the story of his journey from his initial experiences with Bennett Mayrick, his mentor, to his experiences in the lab, where he even now continues his quest to understand how and why healing works — or doesn’t work, as sometimes happens. At the crux of the book are the irrefutable results that he obtained through experimentation on mice that were healed using hands-on healing. Throughout the book, Bengston recounts the stories of numerous people who benefit from hands-on healing, particularly those with cancer. But these success stories, while interesting, are not the focus of the book. What happens in the lab is of primary importance, as Bengston demonstrates unequivocally that cancer can be cured. Over the course of ten experiments on mice that were injected with a form of breast cancer having a 100% fatality rate, and using only hands-on healing, Bengston, and the other healers participating in the experiments, cure almost all the mice in the experimental groups, and, unbelievably, a substantial portion of the mice in the control groups as well. This leads Bengston to his theory on Resonant Bonding, which has implications for current understanding of placebo effects (defined as a change experienced by the subject in the control group based on the subject’s expectation of getting better). Whether you believe or not in alternative treatments, this book has something to teach you, and belief in alternative healing is not a requirement for reading the book. According to Bengston, it is not a requirement for healing, either. The Energy Cure has a tendency to turn your assumptions upside down, something that happens with even more force if you speak with the author, as I had an opportunity to do when investigating the man behind the cure. The idea that belief is instrumental in achieving a cure gets trumped almost immediately — but so does the idea that a cure should be achieved despite a firm disbelief in Bengston’s healing method. The Energy Cure has something for everyone. Those who want anecdotes of healings, those who practice Reiki or other forms of energy healing and want to compare notes or learn a new healing method, and those who are interested in evaluating his research will be unable to tear themselves away from this book. It is not simply the story of one man’s journey with natural healing; it is an analysis of the results of years of research, and a tutorial on the Bengston Method of Healing. If you are interested in learning how to do healings using this method, Bengston provides the “how to” in the latter section of the book. William Bengston, PhD specializes in research methods and statistics as a sociology professor at St. Joseph’s college in New York. He has published articles about his work on energy healing in the Journal of Scientific Exploration, the Journal of Alternative and Complementary Medicine and Explore: The Journal of Science and Healing. A forthcoming article in the Journal of Scientific Exploration will deal with proof of entrainment, something that is also used in sound therapy. Bengston’s focus is on energy healing research and education, rather than practicing energy healing. He has lectured throughout the United States and Europe. Bengston also created a six-CD set, Hands-On Healing, to complement his book and provide audio instruction on his healing method. Sylvia Fraser is an award-winning author who has written six novels and four non-fiction books, as well as a number of articles. Bengston wrote The Energy Cure with the help of Sylvia Fraser. While The Energy Cure fascinates and provides a rising hope that this method is an incredible breakthrough, it leaves us with many more questions than it answers. But Bengston is the most vocal at demanding answers to those questions and continues to relentlessly pursue the research that can provide those answers. I look forward to both learning his method to see where it takes me, and to more articles and books from Bengston on this subject. Bengston, William, PhD with Fraser, Sylvia. 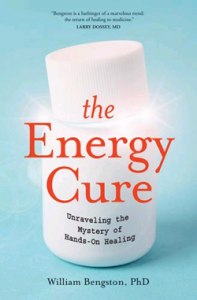 The Energy Cure: Unraveling the Mystery of Hands-On Healing. Boulder: Sounds True, 2010. Bengston Research (Accessed December 21, 2010). Press Kit from Sounds True (Accessed December 15, 2010).